If you are looking for information on the A&W franchise business opportunity, A & W franchises or A and W franchising, then you have come to the right place. One hot day in June of 1919 in Lodi, California an entrepreneur named Roy Allen mixed up a batch of creamy root beer and sold the first frosty mug of this delightful beverage for one nickel. Now, over seventy years later, A&W Root Beer is the world's number one selling root beer and is still made fresh daily and sold at hundreds of A&W Restaurants. Allen experienced tremendous success and in 1923, joined in partnership with Frank Wright creating the name, A&W. In 1925, A&W began to franchise and by 1933 had over 170 units in the mid-western United States. In 1995, Sid Feltenstein recognized the potential of this American icon and purchased the company. With America's fondness for nostalgia and the memories of frosty root beer floats, a rejuvenated A&W emerged and launched a new era of growth unlike any in its history. Mr. Feltenstein, a food service veteran of over 25 years, is continuing to develop new restaurants across the country and around the world. 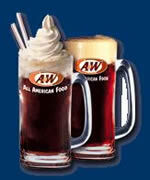 Today, customers can enjoy A&W Root Beer floats and hamburgers in over 1100 locations. A&W Restaurants are still serving the great food you remember - great-tasting food, made-to-order with fresh quality ingredients and always served up with a frosty mug and a warm smile! We still make our burgers, hot dogs, French fries, onion rings, and, of course, our famous A&W Root Beer the way you like it, the way you remember - using fresh ingredients and a measure of care. We're still making memories and you can own a piece of the good old days with A&W and Yum! Brands. In 2002 A&W became a part of YUM! Brands Inc, the world's largest restaurant company in terms of system units with nearly 32,500 in more than 100 countries and territories. Yum! Brands also owns KFC, Long John Silver's, Pizza Hut and Taco Bell restaurants. This is your opportunity to invest in A&W Restaurants and Yum! Brands and experience the power of big, category-leading brands! We believe there has never been a more exciting time to be a part of Yum! Brands and A&W Restaurants! When we created Yum! Brands, we had the privilege of possessing a heritage of success established by the founders of KFC, Pizza Hut, Taco Bell, Long John Silver's, and A&W. Their leadership and innovation helped launch the quick service restaurant industry. The brands they created enjoy worldwide recognition and popularity. Yum! Brands is the biggest restaurant company in the world, and we are the worldwide leader in our product categories! Proven support from Yum! & A&W - You become part of an organization with tremendous franchise support including advertising, business coaching, training, development and cooperative sourcing. We strive to work as "one system" because it's the best way to meet our customer's needs. You invest in us. We invest in you. Advertising & Marketing - Yum! is committed to making A&W Restaurants even bigger. Last year alone, Yum! and its franchisees spent more than $600 million in consumer advertising. National marketing news is communicated regularly throughout the year. Many markets have local advertising cooperatives to coordinate local marketing activity. Franchisees are encouraged, but not required, to participate in system promotions. Coaching - A&W Restaurants has Franchise Business Coaches (FBCs) and/or Franchise Business Leaders (FBLs) to provide business insight and instruction as you operate you're A&W. As you move into steady-state operations, your FBC or FBL will keep you abreast of important business initiatives, organize key regional training activity, and be your primary point of contact. Training - Yum! requires that each franchisee complete Management Team Training prior to the opening of their A&W. Single brands require six to eight weeks training for key restaurant personnel. Multibrand training depends on your level of previous quick-service restaurant (QSR) experience.